A university is to open one of Europe's most advanced science teaching facilities. London Metropolitan University said the centre in north London represents the largest single investment in university level science education ever. The £30m London Metropolitan Science Centre in Holloway includes a Super- Lab which has state of the art interactive teaching equipment. Last week, Tony Blair said young people should be encouraged to be scientists. He was speaking following concerns about the shortage of science graduates in the UK and a 35% decline in university science departments over the last five years. A survey conducted on behalf of the university showed 71% of 15-18 year olds have a positive view of science as a subject. But the way it is taught, teaching facilities and their perception of a career in science are the key factors that influence whether they opt to study it. Spread over four levels, the Science Centre will house research laboratories for HIV and microbiology research, as well as multi-purpose sports-science facilities and a forensics science lab. 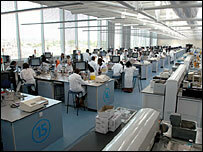 The Super Lab, which has 280 workstations, has facilities which allow tutors to digitally record science experiments and their results conducted by classes. These will then be available to future students via online streaming. The Clinic, housed within the centre, will look at nutritional physiology which looks at the impact nutrition has on brain function and the outcome of pregnancy. It is planned that sections of the facility will be available for local residents to use. London Metropolitan University's Vice-Chancellor and Chief Executive, Brian Roper, said: "London Met has chosen to make this substantial investment in science at a time when many other universities are cutting back. "A decline in the study of science has serious implications for UK's economic future and we are working to combat this. "Science is essential for the development of our country and fundamental to university work." Higher Education Minister Bill Rammell said: "It is vital that we inspire young people and show them the wonders and excitement that science can bring."